After a warm and in some places dry month of July, temperatures started August within a few degrees of normal across the Midwest thanks to a dip in the jet stream centered over the Great Lakes and Ohio Valley. This was short-lived as the flow turned southwesterly and ushered in another round of warm and humid conditions. Chicago, Rockford, Indianapolis, Cincinnati, Columbus, and Dayton all saw temperatures reach the 90s (above normal) for at least a day or two along with increased humidity. Chicago was the big winner with a high of 97 on August 4th; this didn’t break any records, but was a whopping 14 degrees hotter than the average for the date. Rainfall was generally sparse the first several days of the month due to a lack of big fronts or storms in the region. However, an isolated thunderstorm on the east side of Cincinnati managed to produce an extremely localized wind gust of 76MPH on August 4th due to a microburst. This changed starting August 5th, as a slow-moving cold front sagged south from the Midwest to the Ohio Valley through August 8th, bringing scattered storms with locally heavy rain and sporadic severe weather in the form of gusty winds to parts of Ohio, Indiana, and Illinois. 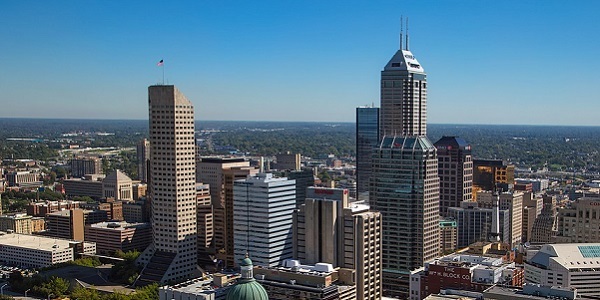 In particular, Indianapolis saw some tree and powerline damage from a storm on August 7th. Most areas had rain totals of less than half an inch from the storms in this time period, though smaller-scale areas saw heavier amounts, like Indianapolis which received 1.82” of rain on August 7th and Chicago which had 2.36” on the same day. Behind the cold front, high temperatures still increased into the mid to upper-80s (a bit above normal), then another front dropped south across the region from August 8th to 11th. This front produced a little bit of severe weather on the east side of the Columbus and Cincinnati metros on August 10th. With locally higher rainfall amounts, Rockford saw 1.31” of rain, Columbus had 1.16” and Cincinnati received 1.33” when all was said and done. Average temperatures (highs in the 80s, lows in the 60s) followed across the region behind this front, before another more substantial low pressure and cold front passed through around the middle of the month. Chicago, Indianapolis, Columbus, Cincinnati, and Dayton all had at least a half an inch of rain between August 15th and 17th, with Cincinnati coming in with an incredible 5.02” of rain on August 16th! This was the second wettest calendar day on record for Cincinnati, and resulted in flooding across parts of southwestern Ohio. Radar shows a plume of moisture across the Ohio Valley on August 16th which caused repeated storms to drop over 5” of rain on Cincinnati, OH. Another several days of mainly quiet weather followed, with temperatures again generally near or just above average across the Midwest (highs in the 80s, lows in the 60s) and isolated rain events. Another strong low pressure system tracked through the Ohio Valley and into the Great Lakes August 20th and 21st, bringing more rain to the region. Most areas saw modest amounts of rain, though locally heavier pockets occurred. Dayton, Columbus, Chicago, and Rockford all got over 0.50” of rain from this system. Also, a brief tornado touched down in Will County, Illinois, just south of the Chicago area on the 20th. After another few days of quiet and mainly dry weather, the last week of the month turned active across the region. Arguably the most severe weather in this region of the month occurred on August 25th in parts of central and eastern Indiana with a warm frontal system. A strong storm developed over Indianapolis, dropping up to penny sized hail and damaging some trees in Marion County, before intensifying just to the east. Parts of Decatur County in eastern Indiana saw up to baseball sized hail with this storm! Additional rain fell on the 28th and 29th in parts of the region, particularly in Illinois, where Rockford and Chicago both received upwards of an inch and a half of rain as a cold front pushed south through the region. All of the Midwest ended up with warmer than normal temperatures for the month of August; Chicago was the warmest at 3.9 degrees above average while Rockford was closer to average at only 0.8 degrees higher than normal. Indianapolis, Cincinnati, Dayton, and Columbus were all a degree or two warmer than average. Rainfall percent of normal for the month of August (Courtesy of NOAA). Much of the region saw more rainfall than normal, especially Cincinnati which finished with 8.21” for the month, which is 4.80” above normal. Dayton, Indianapolis, and Chicago finished with 1.00-2.00” more rain than average for the month, with Chicago and Columbus coming in a little bit less than an inch more than usual. 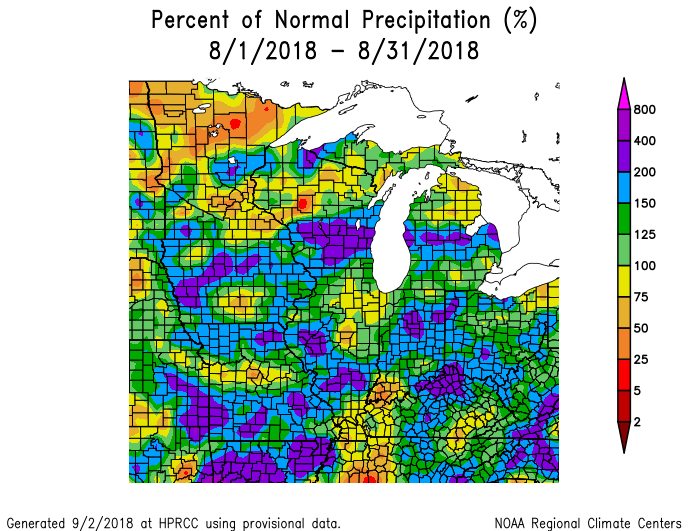 Due to the hit-or-miss nature of thunderstorms, a few parts of central and northern Illinois as well as northern and eastern Ohio did see less rain than average.